Really Like You, the hit single from Sara Lugo’s 2014 album Hit Me With Music, has over 6 million views on YouTube and is still a favorite among fans from San José to Lyon, and beyond. For his new single WISH, [dunkelbunt] teams up with San Francisco based musicians Will Magid (trumpet) & Paul Bertin (saxophone), Viennese singer Mela and MC Alix from Berlin. 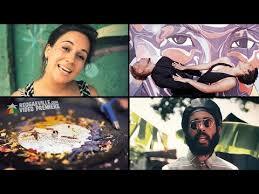 Together they have created a mystic sound collage, enriched with instruments from various countries. The Middle East meets the Californian Bass Coast. The single “EGAL” is the precursor to the new [dunkelbunt] album “Mountain Jumper” which will be released in spring 2015 on [dunkelbunt records]. With this release [dunkelbunt] & Alix demonstrate their boundless ingenuity, when it comes to making transcontinental music: “EGAL” mixes Hip Hop with Bluegrass, German rap meets New Orleans Marching Brass and the sounds of the Mississippi Delta sail on the Aegean Sea. On the mic is Alexander Leuschner aka Alix. Born in 1988 and a native of Berlin’s Neukölln suburb, he’s been rapping using various vocal styles from a young age. Rhythmically refined he he bounces on the verses, thoughtfully and humorously talking about life and his visions. Together with [dunkelbunt] he shares his adopted home of Vienna and a passion for merging different musical styles. Ulf Lindemann aka [dunkelbunt] was born in Hamburg in 1979. At the beginning of the millennium in his Vienna studio, he began to merge electronic music with Balkan, Gypsy and Swing sounds and along with his contemporaries like Waldeck, Parov Stelar and Shantel who helped popularize the new music genres, „Electro Swing“ and „Balkan Beats“. The recent single “EGAL” is the precursor to the new [dunkelbunt] album “Mountain Jumper” which will be released in spring 2015 on [dunkelbunt records]. 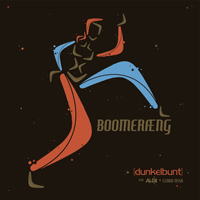 With this release [dunkelbunt] & Alix demonstrate their boundless ingenuity, when it comes to making transcontinental music: “EGAL” mixes Hip Hop with Bluegrass, German rap meets New Orleans Marching Brass and the sounds of the Mississippi Delta sail on the Aegean Sea. “There’s one thing that we will never do together, and that’s make music!“ – „I can still hear myself saying that to Alix. That was about a year ago when we met up for the first time at the Wiener Augarten”, explains Mr. [dunkelbunt] telling the story of how his latest collaboration with the singer ALIX was born. Last summer, Alexander Leuschner, born in Berlin, applied to [dunkelbunt] for an internship and although it had been made clear in the job description that the position did not incorporate making music but focused on the ins and outs of how a label operates he still sent in one of his songs along with a wonderfully brash application letter. The first fruits of this collaboration will be released this summer with Augen zu und durch and Süßwasser Salzwasser the lyrics as the titles suggest are in German, “We inspire each other equally. My music is a homage to him and his lyrics are a homage to me which is both beautiful and liberating.” says Mr [dunkelbunt]. “With that foundation we decided to make an album together and the first release is the track Boomeræng, incorporating rap, vocals and swinging hip hop beats, using oriental and western instrumentation with a urban and nostalgic flair.” The finishing touch comes in suaheli from the kenian singer Cloud Tissa, who collaborates with [dunkelbunt] for years: Kebab Connection, Balkan Qoulou, Give You Action – East Africa meets the Middle East. The Boomeræng Club Version was remixed by the austrian „Electro Brass Collective“ Erwin & Edwin. Ulf Lindemann aka [dunkelbunt] was born in Hamburg in 1979 and came to Austria at the beginning of the millennium to study and make music. In 2002 in his Vienna studio he began to merge electronic music with Balkan, Gypsy and Swing sounds and along with his contemporaries like Waldeck, Parov Stelar and Shantel who helped popularize the new music genres Electro Swing and Balkan Beats. Together with every EP or LP released, [dunkelbunt] creates a special spice blend which is included with the CD or album and at concerts the air is filled with his special fragrances. With a cinnamon wand or with aromatic oil massaging the senses of his audience they are taken on a fantastic trip to the orient or through tropical forests and fields of flowers or to his second home in the Spanish Orange blossom valleys.